Since 1986, the U.S. has minted a one dollar silver coin called a "Silver Eagle". 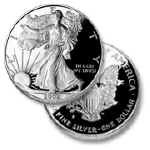 Each Silver Eagle contains one troy ounce of pure silver, and these coins are legal tender. American Eagle Silver Dollar coins are affordable investments, beautiful collectibles, thoughtful gifts and memorable incentives or rewards. Silver Eagles are meticulously crafted to the exacting standards of the United States Mint. The design is based on Adolph A. Weinman's 1916 "Walking Liberty" Half-dollar coin, widely considered to be one of the most beautiful coins ever minted. Congressionally authorized American Eagle Bullion coins provide investors with a convenient and cost effective way to add a small amount of physical platinum, gold, or silver to their investment portfolios. The American Eagle Bullion program was launched in 1986 with the sale of gold and silver bullion coins. Platinum was added to the American Eagle Bullion family in 1997. A bullion coin is a coin that is valued by its weight in a specific precious metal. Unlike commemorative or numismatic coins valued by limited mintage, rarity, condition and age, bullion coins are purchased by investors seeking a simple and tangible means to own and invest in the gold, silver, and platinum markets. American Eagle Gold and Platinum Bullion coins are available in four denominations: one ounce, one-half ounce, one-quarter ounce, and one-tenth ounce while the silver bullion coin is only available in the one ounce size. American Eagle Bullion Coins are not sold to the general public directly from the United States Mint. Rather, they are available through a network of distributors. Silver has historically been the most affordable precious metal. Since 1986, the United States has minted one-dollar silver coins called "Silver Eagles." Each contains a minimum of one troy ounce of 99.9% pure silver. Silver Eagles are easy to buy and sell at most coin, precious metal and brokerage companies. Prices are based on the market price of silver, plus a small premium to cover minting and distribution costs. Affordability. Credibility. Beauty. They're the qualities that have made American Eagle Silver Bullion Coins the world's best-selling silver coins, with more than 90 million sold since 1986. They're reasons to invest in " Liberty" today.